Watch your baby thrive in our care!! The focus of our infant program is to provide the children with a safe, loving, and nurturing environment based on their unique and ever changing needs. As the infants grow, a selected primary caregiver will grow along with them. 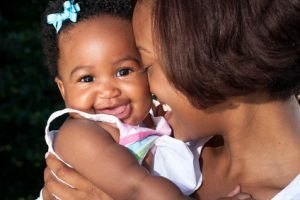 This will provide the infants and their families with the consistency and trust necessary to help form and foster the emotional bonds crucial for their early development. A day in the life of our infants consists of a safely designed classroom where infants enjoy an array of stimulating, age appropriate toys, and classroom equipment. The infants and their caregivers play, read, sing, and have fun together, while following individualized varying schedules that include bottle feeding, eating, diaper changing, and naptime. Breast feeding is also welcome, if needed. Daily Grams keep you informed! At pick-up time, parents/guardians will receive a "Daily Gram", which allows caregivers to provide families with daily communication of their child's day. In the gram, the parent/guardian will know how the infant's eating and sleeping patterns were, what he/she enjoyed throughout the day, and any other pertinent information relating to his/her day.